As we’ve written about before, the transition from an ‘individual contributor’ to a ‘leader of others’ is one of the most challenging transitions a person will face in their career. In fact, supporting people as they navigate this tricky stage is one of the reasons we designed Discovery in Action in the first place! 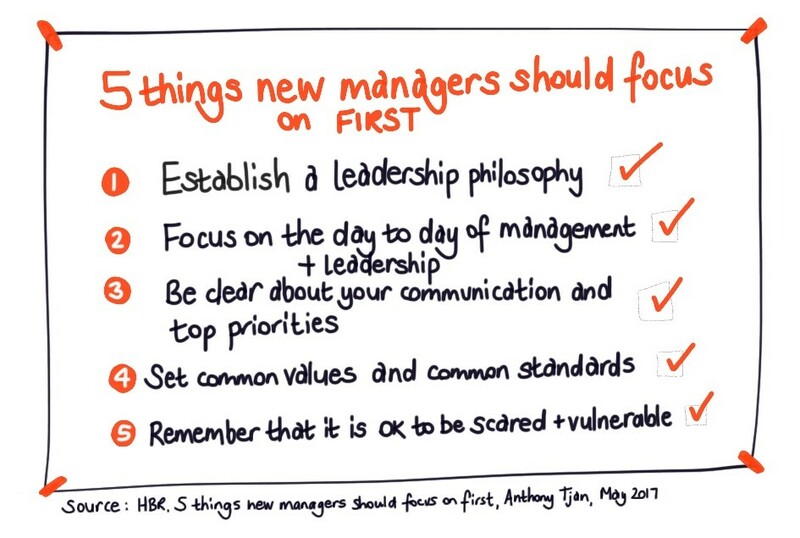 A May 2017 HBR article by Anthony Tjan provides some really useful advice about the 5 things a new manager should focus on first. Link to original HBR article. 2.Focus on the day to day of management and leadership – make time to get to know your team members. Understand the key strategic priorities. Ensure team members have the necessary resources, processes, systems + authority to do their job well. 3.Be clear about your communication and your top priorities – what are the most important things to be focusing on now? Make sure your team are clear about the priorities, their role and standards of performance. And communicate these at every opportunity. 5. Remember that it’s okay to be scared and vulnerable – one of the first priorities as a new leader is to build relationships built on trust. One of the quickest ways to do that is to be honest about what you do know, what you don’t, and to demonstrate an ethic towards finding out the answers to the latter. Extend your network to include other leaders, and seek out mentoring opportunities. All leaders started somewhere! As we’ve said before, the best leaders are not defined purely by their skills and attributes. The best leaders firstly want to be a leader in the first place, and carry a mindset of wanting to be the best leader they can be, always improving. It is not just about who they are – but about what they do – their actions and behaviours. *With DIA, we go even further : participants develop their own unique people leadership model – consisting of beliefs about when people perform at their best, as well as the detailed actions and behaviours that support those beliefs. This is tested with those they lead, and each leader identifies an action plan to help leverage their strengths, and tackle any gaps*. If you are an alumni of the DiA program, get out your model. Remind yourself about the answers to these questions. What can you do to make that happen? ← Is there a difference between organisational culture and organisational climate?